At the Church of Pater Noster on the Mount of Olives, Christians recall Christ’s teaching of the Lord’s Prayer to his disciples. 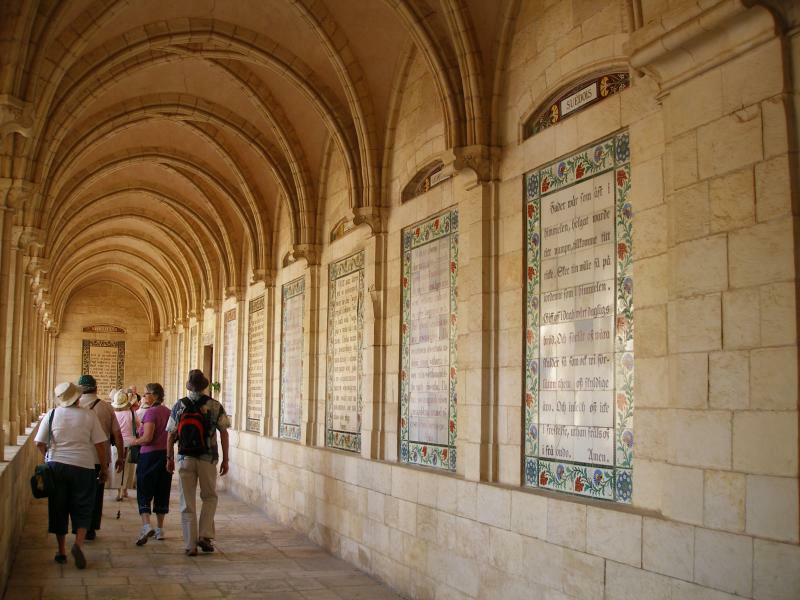 On walls around the church and its vaulted cloister, translations of the Lord’s Prayer in 140 languages are inscribed on colourful ceramic plaques. A giftshop sells postcards of each plaque and the associated Convent of Pater Noster website offers translations in more than 1440 languages and dialects. A long tradition holds that Jesus taught the Lord’s Prayer or Our Father in the cave that forms the grotto under the church. When the Crusaders built a church here in the 12th century, they called it Pater Noster (Latin for Our Father). Pilgrims of the time reported seeing the words of the prayer inscribed in Hebrew and Greek on marble plaques. Excavations have uncovered a Latin version. The Gospels suggest that Jesus taught the Lord’s Prayer at least twice. Matthew 6:5-15 has this teaching as part of the Sermon on the Mount in Galilee; Luke 11:1-4 has it while Jesus is on his way from Galilee to Jerusalem. The cave under the Pater Noster Church certainly existed in Jesus’ time. Near the summit of the mount, it would have been a secluded and sheltered place for a small group to gather. The earliest reference to Jesus teaching in the cave is in the apocryphal Acts of John, dating from the 2nd century, but it does not specifically mention the Lord’s Prayer. Later the Christian bishop and historian Eusebius (260-339) wrote that “in that cave the Saviour of the Universe initiated the members of his guild in ineffable mysteries”. When the Emperor Constantine built a three-level church on the site in 330, it commemorated the Ascension of Christ. This historic church was known simply as the Eleona (from the Greek word meaning “of olives”). The cave is also believed to be associated with Jesus’ teaching about the destruction of Jerusalem and his Second Coming (Matthew 24,25). 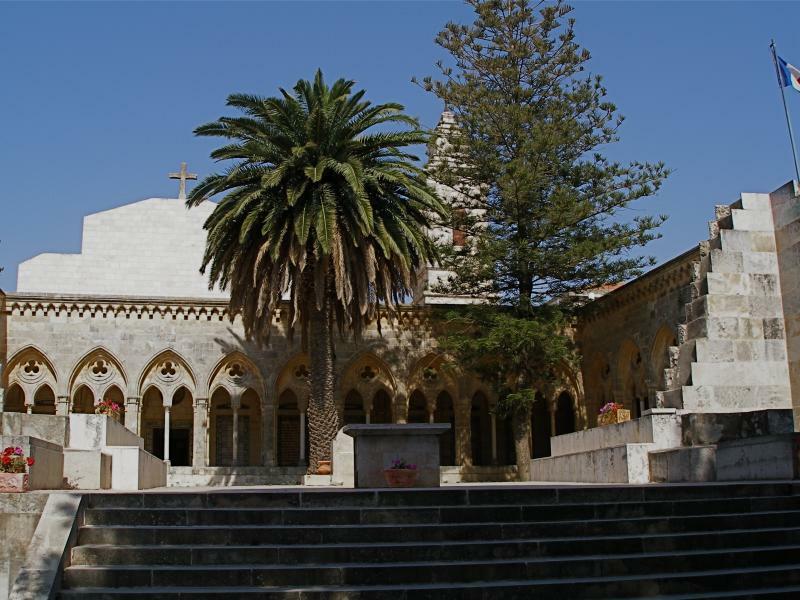 The present church and its cloister were completed in 1874 by an Italian woman who was the widow of a French prince. 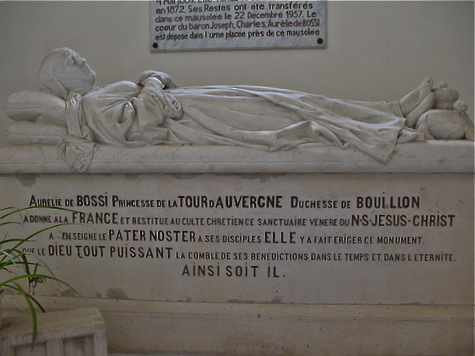 Aurélie de Bossi, the Princess de la Tour d’Auvergne, had a particular devotion to the Lord’s Prayer. She erected translations of the prayer in 39 different languages. Later she added a convent for Carmelite Sisters. While the buildings were being constructed, she lived nearby in a wooden cabin brought from France. The princess was also keenly interested in the cave — which she never discovered, although she suggested where it might be. Excavations by archaeologists in 1911 found the cave exactly where she had predicted it to be. It was partly collapsed when it was discovered. The princess died in Florence in 1889, but her last wish was for her remains to rest in the Pater Noster Church, in a tomb which she had prepared. Her wish was fulfilled in 1957. On top of her sarcophagus is a life-size effigy. Pater Noster Church is a part-reconstruction of Constantine’s Eleona church. Built to the same dimensions, it gives a good idea of what that original Byzantine basilica looked like. The garden outside the three doors outlines the atrium area. In 1920 construction began on a new Church of the Sacred Heart over the grotto. Work was abandoned in 1927 when funds ran out, leaving the base and walls open to the sky. Steps below the altar platform lead down to the crypt of the 4th-century basilica, partially built in the cave. But only a little of the stonework remains of that original church. A 1st-century tomb, which Constantine’s engineers had blocked up with masonry, can now be seen. Open: 8am-noon, 2-5pm (Sunday closed).